This paper reports on an investigation of the out-of-plane structural behaviour of slender prestressed (restrained tendon) brick walls. In particular, the interactions between slenderness, axial load, and prestress are discussed. 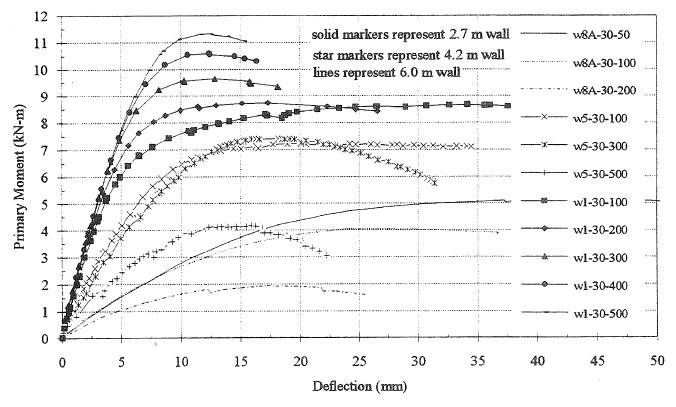 At all slenderness levels, the prestressed walls supported axial loads greater than those which would typically be found in low-rise construction. Also, the use of prestress was more effective at higher slenderness, and controlled the onset of cracking. At low slenderness, the axial load behaved as a prestress. The prestressed walls also exhibited a high resistance to repeated loading, which made it possible to perform multiple tests on each wall.